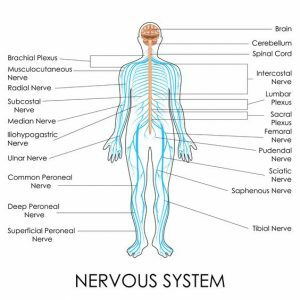 nerves is the sciatic nerve. The sciatic nerve is one of the main spinal nerves that arise from the fourth lumbar bone L4 to the third sacral bone, S3. This nerve runs along the entire lower extremity from the posterior portion. The sciatic nerve is the longest and the widest singular nerve in the human body. Its length is the result of the distance it covers, from the hip to foot while the width is the result of the fusion of nerve bundles arising from five vertebrae, L4 to S3. The sciatic nerve arises from the lumbosacral region and passes through the pelvic girdle. Passing through the entire length of the lower extremity, it terminates into the foot muscles. The nerve runs along the back of the legs i.e. posteriorly. The sciatic nerve fibers start from the lumbar and the sacral plexus. The nerve fibers originate from L4, L5, S1, S2, S3 vertebrae of the vertebral column. After merging together near the piriformis muscle, the sciatic nerve descends down the piriformis. It exits the pelvis through the greater sciatic foramen and enters the femoral region. After passing through the thigh muscles, it reaches the popliteal fossa. Both the branches finally terminates into the foot muscles. The sciatic nerve is the largest and the widest nerve in the human body arising from the lumbosacral plexus of the spine. It is a spinal nerve and hence is responsible for both motor and sensory functions. The neurons run parallel to each other within the nerve bundle. A layer of connective tissue wraps the neuron cell. This connective tissue layer is termed as the endoneuron. 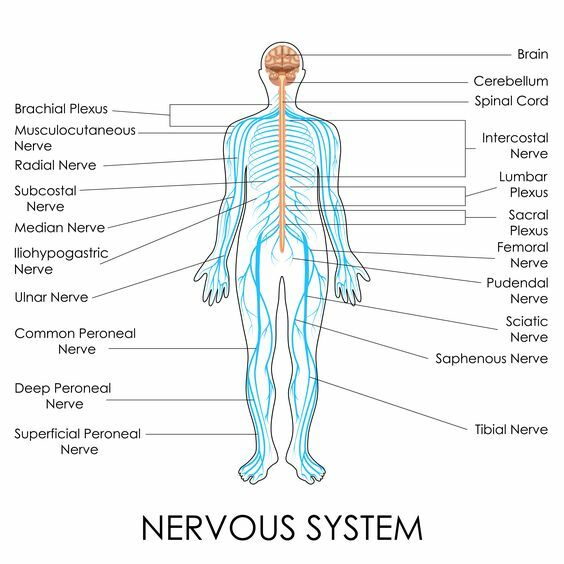 The nerve bundle is known as the fascicles. The connective tissue membrane that surrounds the bundle is known as perineuron. Many such fascicles fuse together to form the sciatic nerve. It is wrapped by the connective tissue membrane known as epineuron. The nerve is richly supplied with vascular bundles. The blood helps in transporting oxygen to the nerves and also the removal of waste products. The blood also ensures the relay of information through the synapses by maintaining the ionic balance. The main function of the sciatic nerve is to supply sensations to the skin of the leg except for the interior portion of the leg. This is because the nerve itself runs along the back of the leg. The fibular sciatic nerve is responsible for transferring stimulus to and from the lower leg. It is also connected to the upper surface of the foot. The nerve innervates the muscles of the lower leg i.e. in the femoral region while the two branches innervate the lower region of the calves. The fibular nerve innervates the muscles of the lateral, anterior compartment of the lower extremity along with the foot muscles. Sciatica pain is a condition where the sciatic nerve is either compressed or is injured due to a possible number of reasons. This compression or partial injury imparted to the nerve causes pain that starts from the lower back and extends till the leg. • The pain is sometimes common in pregnant women, especially during their late pregnancy period. In people, who suffer from sciatica nerve injury, the pain is a result of some other medical process. For instance, it has been proven that in most of the cases, this nerve is injured during the replacement of the pelvic bone with a hip prosthetic implant. This injury can also be caused if something is injected into the buttock in a wrong manner. The wrong process will hit the sensory neurons within the sciatic nerve, resulting in the loss of sensation. Sciatica pain is medically defined as a condition where there is a shooting pain from the waist down the legs. This is caused due to the compression of the sciatic nerve. Pain is the most common symptom of sciatica but its symptoms vary from person to person. The condition is not life-threatening. But if the condition worsens, the pain will elevate to a point where you will not be able to move your legs. In such conditions, medical practitioners advice for a spine surgery. Can rest help in reducing the sciatica pain? Doctors suggest that a person suffering from sciatica pain should take rest. It is because sitting or standing for hours put pressure on the nerve and the pain heightens. A proper bed rest can reduce the pain in the initial stages.